D-Day landings, aerial operations. 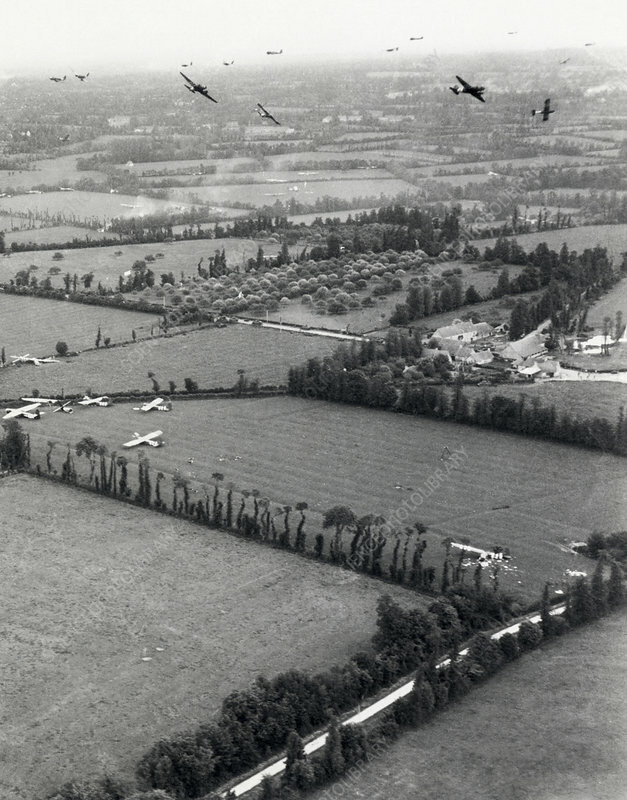 Glider reinforcements arriving in Normandy, France, during D-Day operations on 6 June 1944. At top, US Army Air Forces Douglas C-47 Skytrain aircraft are banking after their CG-4A gliders have been cut loose from their tow lines. The aircraft reinforcing US Airborne Division troops as part of the airborne assault that preceded the amphibious invasion on D-Day. On the ground are Airspeed Horsa gliders. The D-Day landings of 6 June 1944 successfully liberated the Normandy coast of Nazi-occupied France, contributing to the Allied victory in World War II.